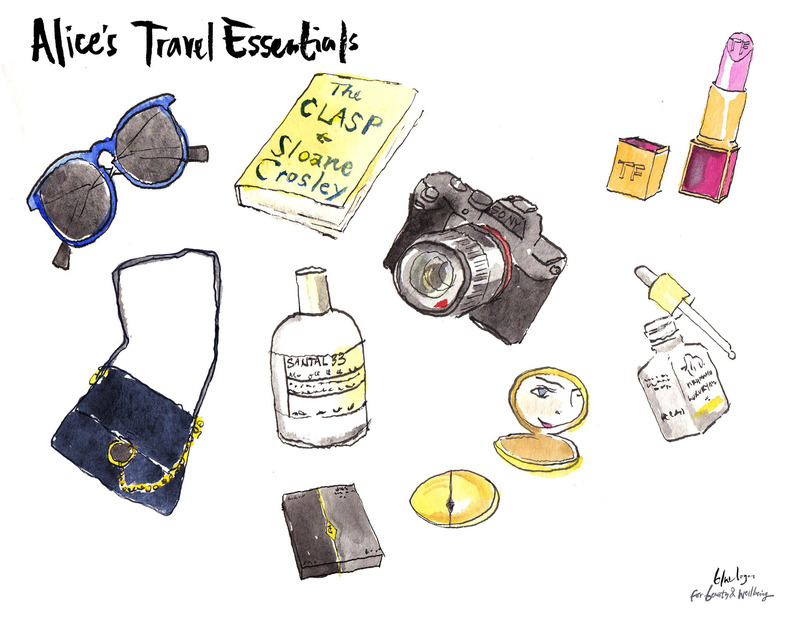 The lovely Clémence of Beauty and Well Being published a little illustrated bit on some of my travel essentials. I wanted to share it here since it's so darn cute. Nothing up there should really come as a surprise – at the time I was listing the items, I was reading Sloane Crosley's The Clasp, though I will say I much prefer her non-fiction writing. I can't go anywhere without this powder; it's more of a daily essential than just a travel one. You all probably know by now my travel camera is a Sony A7R II. It costs a pretty penny but the quality you get for the portability of it makes it completely worth it. I'm currently waiting for the new Sony G series lenses so I can finally get a good 24-70mm for this guy (just take all my money, Sony). The facial oil from Drunk Elephant is a saving grace on long haul flights and NYC winters. My dopp kit isn't complete without at least two lipsticks from Tom Ford (specifically the matte ones), which are still the longest lasting of all the lipsticks I've tried. And of course, I can't forget to pack a scent – you can't go wrong with Le Labo's Santal 33, and a pair of sunglasses (usually a "cheap" pair because I've lost too many to count on travels...). A little off-topic but are there any smallish bags in the ~$1500 range that you have your eye on lately? Looking for a new everyday bag that I could also wear to a nicer dinner, etc. The Faye reminded me as I had had my eye on the small one in all black leather but it seems to have sold out. Ooh fun! I love the Marni Trunk bag right now, and so many fun color combinations to get it in. I also surprisingly like the Gucci Dionysus. And it's a bit pricier, but also have always like the sac universite from Saint Laurent! I'm currently looking for a new travel camera. Will definitely check out the one you mentioned.